Dr Billy Graham, often called one of the most influential Christian leaders of the 21st Century, died on 21st February. He was a powerful influence on my life in the 1950’s and 60’s, and not in a good way. 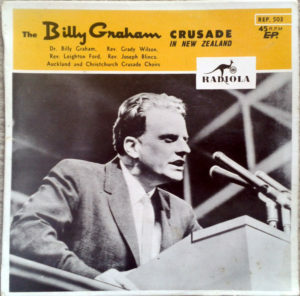 His evangelical preaching filled stadiums worldwide including New Zealand in 1959 but by the time of his visit in 1970, numbers had dwindled. Perhaps, people had begun to doubt the truth of his message or noticed that it could be poison. There’s no doubt Billy Graham was dynamic, entertaining, charismatic and honestly believed what he preached. Another perspective is that he was an emotional blackmailer who peddled a quick, but unlikely fix to fear. His short, punchy sentences that promised reassurance appealed to people released from the fascism of Hitler and now struggling with the prospect of Stalin and communism. Billy Graham knew what to do. His first task was to ensure people knew they were sinful and rotten to the core by using biblical texts to prove his point. Eternal damnation and torment were then wheeled up as the consequence of unbelief. Once people had their faith in themselves and ability to manage life undermined, Jesus Christ was suggested as the only answer. It’s a formula that’s been used by charlatans across time. Shame on you Billy. But churches haven’t stayed full, either in Britain or New Zealand and adherence to Christianity is collapsing in the western world. By now, many of the people caught up in the evangelical fervour of the Graham crusades will have different approaches to their spiritual journey. Robust theological education will have shown some that reading ancient texts literally is a disaster and illustrating that the Jesus stories may have grown out of earlier mythologies will have provided others with an altogether more fascinating journey of exploration. One week after Billy’s death and ever the optimist about theological development, I approached an Ash Wednesday service with enthusiasm. Now that I no longer belong to a religion I get to experience church events as a singer, there to provide a service, but outside the gathered community. A bit like a kid with her nose pressed up against the window. I wanted Ash Wednesday to be a great show. After all, you don’t have to do much but have few words and stirring music as people are daubed with this powerful symbol of ashes, a stark way to acknowledge that we are formed from the elements and will all end up as dust. Disappointment prevailed when we had to repeat over and over again how bad we were before asking forgiveness from a God, who may or may not have heard the request. Yet, as I looked around, all I could see were a bunch of people trying hard to live good lives. As the service continued, we were reassured that help was at hand because Jesus died to bring us eternal life. So, what happened to living into the vulnerability of our mortality I wondered. Driving away that night, I reckoned that the powerful symbol of mortality had been completely destroyed by introducing the message that had been at the heart of Billy Graham’s crusades. You are sinful, you are unable to manage your life, only believe and you will be saved. A repetitive story that was one of the most destructive forces in my life. But, to be fair, I wondered if Billy had thought more deeply about theology in his later years. Sadly, no. In a video entitled Billy Graham’s last message to America and the world, he continues to say that we deserve hell and judgement if we don’t believe what he preaches. Everyone has the right to believe what they like, but when you’re in a position of power and influence over others, there’s a responsibility to inquire more deeply into the messages you give based on your belief system. Especially when those messages routinely undermine people’s ability to manage their own lives and have been repeatedly discredited by rigorous academic scholarship. Shame on you Billy Graham. Thanks Owen. May Xplorations keep flourishing. Will be doing a presentation at St Andrews on the Terrace for their Common Dreams Conference in September. Will keep you posted on the title and content. The US has continued to proceed in creating a theocracy dominated by this religious aberration. The scariest part is those of us eletist progessive intellectuals, in our haste to rid ourselves of the Trumpster, will put into the presidency a much more terrifying fundamentalist, a true believer who will hasten the transition to a Handmaid’s Tale. I fear thins will get a lot worse here, before any hope of a recovery of our national sanity. Good cause to be afraid. Interesting reflection Allan. I await the next series of The Handmaid’s Tale to help me unravel the future possibilities! I was always regarded as odd by my church friends in South Africa, as I dared to express that Billy Graham’s theology made me feel uncomfortable (without really knowing why at the time )…. now I have seen through the dreadful ladling of guilt that he and others were so good at dishing out. Thanks Sande…. That’s an interesting reflection Liz. That sense of uncomfortableness that is sometimes hard sometimes to identify but that only makes sense sometime later. I’m unclear why Christianity has ended up with such a guilt laden history. This is not how the Jesus character in all the stories would want it, or so it seems to me. I was always regarded as odd by my church friends on South Africa, as I dared to express that Billy Graham’s theology made me feel uncomfortable (without really knowing why at the time )…. now I have seen through the dreadful ladling of guilt that he and others were so good at dishing out. Thanks Sande…. I’ve always been amazed that so few have picked up on the spiritual extortion embedded in the message of Christianity. Join us, or face eternal damnation. Thanks Terry. To be fair to many of my colleagues, it has softened over time, especially as we’ve moved into different time and place and with better academic scholarship around it all. However, evangelical Christianity, especially in the United States continues with the hellfire and brimstone approach. But to be honest, until institutional Christianity admits that we’re dealing with mythology and story, rather than actual world events, I don’t see us helping people to develop their own myths to live by.